Part of the oath of office for a Wyoming legislator is to uphold the Constitution of the State of Wyoming. A violation of that oath should lead to removal from office. Sue Wallis knowingly and deliberately violated her oath of office by not only voting on a “measure” she had a private (and pecuniary) personal interest in but for such a bill she also sponsored, a major violaton. She has violated W.S.§ 9-13-106 as well. Sue Wallis is not fit to serve in the Wyoming House of Representatives and should be removed. amendments; and providing for an effective date. Wallis, Zwonitzerson, WStubson, Teeters, Thomp, Dn. and Zwonitzer, Dv. Wallis, Zwonitzerson, Throne,Simpson, Steward, Stubson, Teeters, ThompW, Dn. of wild and feral horses on federal, state, tribal and private lands. 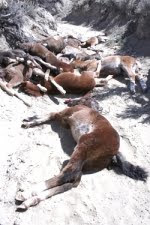 On Sunday, April 25, two Bureau of Land Management (BLM) employees found carcasses of 12 foals that were shot, killed and dumped on BLM land 15 miles east of Marbleton. The foals appeared to be newborn, 1 month to 1 week old, BLM Law Enforcement Ranger Shane Wasem said Wednesday in a statement. The animals were shot and dumped on Saturday, April 24, Wasem said. The foals were privately owned and not wild horses. They had been transported from private property to BLM-administered land. Wasem said a joint investigation between the BLM and Sublette County Sheriff’s Office (SCSO) netted a cooperative suspect. Federal charges are pending because of the location where the foals were found. “BLM jurisdiction lies strictly with the dumping of private livestock onto BLM lands,” he said. The maximum penalty for illegal dumping is one year in jail and/or $10,000 fine. Wasem would not reveal details or name the suspect, saying the case is under investigation. However, Sublette County Attorney’s Office spokesperson Randall Hanson said his office will not file charges against anyone involved in the incident. The horses’ owner, Hank Franzen of the Powder River Rodeo Company, said he learned of the incident after the fact. He explained his herd of a dozen 4-year-old mares wintered on land owned by the Miller Land & Livestock Ranch near Big Piney. He said he was notified his horses were doing well although one of the mares was pregnant. But, according to Franzen, when his son and son-in-law arrived at the ranch to take the animals to summer pasture on April 24, the pair was surprised to find all 12 of the mares had foals and the group was undernourished, he said. At that point, his son called Franzen who said he was out of cell phone range in Utah. The decision to put down the foals was made by consensus with his 22-year-old son, his son-and-law and his 58-year-old friend Bill Griffin who lives on the ranch and “offered to gather those horses and work them,” Franzen said. He said all the animals were weak and the mares were without milk. He also insisted the decision was not made for economic reasons, saying the men were concerned the foals would overstress and possibly weaken and kill the mares. “It was the passion of the animals’ suffering is why they were put down,” he said, adding the men didn’t believe the horses could have survived the trip to summer pasture. Franzen said he did not know details about how the horses were put down. “I wasn’t there,” he explained. But he stood by the decision to put them down. However, he was not supportive of dumping the foals on public land, explaining Griffin was responsible for that decision. He said the incident has been difficult for his family. He also said he does not know how any stud was able to breed the mares – the gestation period for a mare is about 11 months. Tara Miller of the Miller Land & Livestock Company responded to the incident with a statement. The statement said the mares were keeping the foals away from the main herd of 74 animals. “Being young, on winter grass and having to protect their colts, (the mares’) condition had to have quickly deteriorated,” it read. The statement also said the Millers’ stallions, kept on a separate ranch, did not get into the Franzen mares. The horses were kept on Triple Bar Ranch pasture north of Highway 351. Griffin was reached on Thursday for this story; however, he did not contact the Sublette Examiner by press time. Jackson veterinarian Ernie Patterson, who has 30 years working with horses, explained mares will sacrifice their body to feed their foals. He said in the Upper Green River Valley’s climate, pregnant mares typically require supplemental feeding on winter pasture. “If you want to be humane to the mares, you feed them,” Patterson said. Patterson added if the mares were severely starved, they would have aborted their foals. He said the 12 foals could have gone to another home, although he acknowledged raising each one would have been time consuming and expensive. And he said the market for horses is severely depressed. Pro-slaughter interests have once again used a state legislature to advance their agenda to return horse slaughter to the U.S. They have pushed through the Wyoming legislature a new law, H.B. 122, introduced by Wy. State Rep. Sue Wallis who is also the self-styled Executive Director of the United Organizations of the Horse, which is said to unite The United Horsemen's Front, The United Horsemen's Alliance, and The United Horsemen's Political & Legal Action Fund. "Front" is probably the most appropo name for this collection of horse slaughter supporters. Front for pro-horse slaughter interests. It's not clear that when Wyoming residents elected Wallis as a state representative, they understood she would act as a shill for pro-slaughter interests. The new law allows the Wyoming Board of Livestock to "send for slaughter" any abandoned, estray, feral, or abused animals under their control. The Board can already sell these animals at auction so including the phrase "send for slaughter" in the law doesn't add to the Board's current authority. It just sends the message that horse slaughter is acceptable, even desirable. (ii) For profit entities at market cost for the processed meat." Wallis says she would like horsemeat made available to the "poor" for the cost of "disposal", processing (aka slaughter) and "delivery". Another front....Because the real benefit theoretically goes to "for profit entities" that would sell it. Theoretically because, of course, commercial horse slaughter in the U.S. for human consumption is not legal. No state law can change that. Also, there is no market in the U.S. for horse meat. Americans, poor or not, don't eat horses. The "for profit entities" Wallis is assisting will sell the horsemeat as a delicacy in some foreign countries at great profit. American communities including those in Wyoming will see none of that profit. When the 3 U.S. based slaughter houses were in operation, profits were siphoned off by their foreign owners. In 2004 Dallas Crown, Inc., for example, which operated a horse slaughter facility in Kaufman, Texas until 2007, paid $5 in federal income tax on $12 million in sales. In the previous 5 years foreign-owned Dallas Crown's federal income tax was .3% or 1/3 of 1% of gross revenues or sales. Dallas Crown paid no sales tax because its products, horse meat, are sold and consumed in foreign countries. Former Kaufman mayor, Paula Bacon, explains, "My community did not benefit. We paid." Even the foreign markets are shrinking as the French and Italians consider bans on horsemeat, and the European Union has issued restrictions on imports of American horsemeat that contain substances that make the meat unfit for human consumption. Substances banned range from toxic wormers to phenylbutazone (PBZ), the "aspirin" of the horse world, and even include fertility drugs that can cause miscarriages in women. "PBZ is a known carcinogen and can cause aplastic anemia (bone marrow suppression) in humans", says Equine Welfare Alliance (EWA) member, Dr. Ann Marini, Ph.D., M.D. But the list of contaminants is not limited to conventional drugs. "Some of the garbage ‘treatments' that are given to performance horses included iodine-peanut oil injections along the spine, anabolic steroids, cocaine, amphetamines, opioids and even snake venom", explains Dr. Nicholas Dodman, DVM at Tufts University. The new Wyoming law is, in effect, another pointless law offered simply to try to make horse slaughter acceptable, even desirable, to Americans who have rejected it in poll after poll. Americans understand the profitability of this sordid practice depends on animal cruelty. What is particularly disturbing about this new Wyoming law is its astonishing cruelty. As Vicki Tobin, founder and vice-president of Equine Welfare Alliance, points out, "They didn't even consider that these horses might be adopted out or placed with rescues." It's true. The only option the pro-slaughter interests gave for these poor animals is "send to slaughter". How Americans dispose of unwanted horses has been controversial for many years, especially since all horse slaughtering facilities in the country were essentially closed by the federal government in 2007. A new law in Wyoming that goes into effect in July would allow certain horses to be humanely slaughtered in the state for human consumption at state restaurants or state institutions. But several national animal rights organizations have already pledged to file lawsuits to keep the killing from happening. In addition, while the new law says the Wyoming Livestock Board can enter agreements with licensed meat processing plants to sell the meat to state institutions and nonprofit organizations, the board's director, Jim Schwartz, bluntly said, "That's not going to happen." Schwartz said the board will continue to sell horses at auction. "Send to slaughter is not an option in my opinion, and I would never want to dispose of them, although I may have to someday," the director said. The bill, which passed both houses of the Legislature by wide margins with little public attention paid to the issue, was sponsored by Rep. Sue Wallis, R-Recluse. Wallis is also director of the nonprofit United Organizations of the Horse, which plans to set up an operation at the old railroad stockyards in Cheyenne to screen horses and provide rehabilitation, training or slaughter, depending on their condition. There is one advantage to such a system: Some owners who have old horses past a productive life or that are dangerous or untrainable simply let the animals roam, effectively leaving them to starve to death on the range. That's certainly inhumane and not an acceptable option. Wallis said an animal behaviorist and scientist at Colorado State University is working with her group to develop a humane way to slaughter the horses given to the organization that fall into the above categories. Horse meat is consumed in many countries in Europe, South America and Central Asia and is often considered a delicacy. However, because of the role horses have played as a companion and a worker, plus concerns about the cruelty of the horse slaughter process, it is a taboo food in many cultures, including ours. 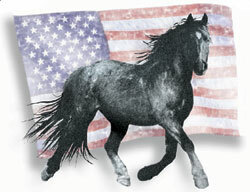 Americans have shown in poll after poll that they oppose the slaughter of horses. A 2009 poll by Public Opinion Strategies found that 69 percent of American voters are opposed to killing horses for people to eat. Horses simply are not raised for meat production in this country. Instead, they are raised as pets, for working purposes (border patrol, police work and ranching) or for sport. We don't expect that attitude to change, as it's deeply ingrained in our culture. Most Americans -- and we suspect many people in Wyoming -- view eating a horse as akin to eating a dog or cat. There are also some serious health concerns about humans consuming horse meat. Since there is no system for tracking drugs or other substances given to them, horse meat can contain toxic wormers and phenylbutazone, a known carcinogen that can cause bone marrow suppression in humans. Given the opposition of the Wyoming Livestock Board and the certain legal challenges, it doesn't make sense for Wyoming to fight for the right to slaughter horses so they can be sold to state institutions. The federal prohibition of horse slaughterhouses, combined with the strong resistance to the idea from a majority of Americans and the cost of defending against lawsuits, make it a lose-lose-lose proposition for Wyoming. Today the Cloud Foundation launches Herd-Watch, an innovative volunteer program to monitor wild horse and burro herds as well as roundups across the West. The iconic horses and burros are currently being managed to virtual extinction. From this day on, Herd-Watch will: watchdog America's wild horses and burros, provide increased public visibility, monitor the range conditions and the mustang, burro and livestock numbers as well as keep tabs on the Bureau of Land Management's (BLM) plans for "management" of each treasured American Herd. "The more the public knows about our wild herds, the more deeply they will care about their preservation. Through Herd-Watch we will educate and inform the public while protecting an American treasure," explains Project Manager Laura Leigh of Nevada. "Herd-Watch is an exciting and interactive new development facilitating improved protections for our wild herds and, we hope, an improved dialogue with both the BLM and Forest Service." A central database will keep tabs on each of America's remaining 180 herds on public lands in ten Western States and their ranges. According to BLM, in 1971 339 wild herds were designated for protection. Since then the BLM and Forest Service have zeroed out 159 herds, including 12 in Nevada just last year. Volunteer teams will log and catalog data, photos and information following their visits to the range. The Cloud Foundation hopes that BLM and Forest Service officials will welcome the increased interest and monitoring of wild herds at no cost to taxpayers. Interested members of the public are encouraged to visit www.thecloudfoundation.org to volunteer, donate and learn more. "Herd-Watch will remove our wild herds from the ranks of the anonymous. Through the work of dedicated volunteers, the public will learn about each amazing herd of wild horses and burros and what can be done to preserve them for all time, as the Wild Horse and Burro Act intended," states Ginger Kathrens, Cloud Foundation Executive Director and Emmy award-winning producer whose Cloud documentaries have educated a world public about the rich lives of wild horses. CHEYENNE -- A Wyoming state legislator with designs to start a horse slaughter operation said Monday it would be part of a broader plan to rescue abandoned or unwanted horses. Rep. Sue Wallis, R-Recluse, said the nonprofit United Organizations of the Horse would accept donated horses, either from the Wyoming Livestock Board or individuals. She referenced a lot of about 230 feral horses the Wyoming Livestock Board sold recently for $1 each during a public sale in Rock Springs. Horses would be evaluated and either sent to rehabilitation, rejuvenation or slaughter, according to Wallis. "We think that we will probably work up to the point where we're killing 20 horses a day," she said. Wallis said that since slaughter was taken off the table as an option for horses in America, the industry has fallen on hard times. "Many of us believe that the best and responsible solution is humane slaughter and good use of that meat," she said. Wallis said the organization has started negotiations with the Wyoming Livestock Board to take over the Cheyenne stockyards across West Lincolnway from the former Hitching Post Inn. "It is not where we are going to slaughter horses," Wallis said. She described it as being somewhat of an intake facility. Wallis envisions a mobile slaughter operation that can be taken to different areas of the state. She said one exists in South Dakota for buffalo. She said they are working with Temple Grandin, an animal behaviorist at Colorado State University in Fort Collins, Colo., on designing a humane slaughter process. The meat would primarily be marketed for zoo feed and pet diets, Wallis said. "And we already have customers for those products," she said. She believes there may be a small market for human consumption within the state. Wallis said she has eaten horse meat on a trip to Canada and found it tasted good and was tender. "The rest of the world just sees this as an ordinary food source," she said. It is unclear whether the federal government would consider horse products legal to enter commerce for human consumption, even within the state. Congress yanked the U.S. Department of Agriculture' s funding to inspect horse slaughterhouses in 2006, effectively shutting down such operations. The USDA cannot get involved. Interstate distribution of meat is barred. The particulars of canning the meat have yet to be worked out, according to Wallis. "We are still evaluating possible locations, but it will probably be an existing meat processing facility somewhere in the state," she said. Dale Steenbergen, president and chief executive officer of the Greater Cheyenne Chamber of Commerce, said if the possibility of a slaughterhouse coming to Cheyenne becomes more than a rumor, then the chamber may discuss it. On a personal note, Steenbergen, who is involved in ranching, said it would be good to have some discussion on what to do with abandoned horses. He said that he had one turned out on him last year. "Is it better to starve them to death or put them down humanely?" he said. "We've got to figure out something to do because this is a huge, huge problem." The plan has caused a stir among the state's animal welfare and animal rights activists, who question both the legality and morality of such a slaughterhouse. Patricia Fazio, who has been involved with animal welfare issues at the state and local level in Wyoming since 1994, said horses are not meat animals like cattle. Fazio said horse meat can be contaminated and is not safe for consumption. She also questioned how big of a problem abandoned horses are. "Our conclusion is it's kind of a ploy that they're using," she said. Fazio said there are other horse rescue operations operating in the West. "There is no need to do horse slaughter," she said. "I agree there are some animals that are sick or beyond helping from a medical point of view we should just be euthanizing, " she said. Jeannine Stallings, a Cheyenne resident who is the founder and president of Wyoming Advocates for Animals, said she is disgusted by the idea of a horse slaughter and cannery. "I just can't believe anyone can be so mean spirited as to even consider such an idea," she said. A Horse Slaughter house and meat cannery in Cheyenne? Here are Toll Free Numbers for the Capitol Building. Ask for your Representative or Senator. See what to say when you call at bottom of page. We need your help to pass anti-horse slaughter legislation! HOW TO MAKE CALLS TO LEGISLATORS! Most everyone you will hear on the other end of the line when you call is hired specifically to take calls and make a record of your call. Simply call and say " My name is ______and I am calling to ask Representative/Senator ______ to cosponsor and vote YES for The Prevention of Equine Cruelty Act (H.R. 503). They may ask your name and address and then they will say thank you for calling and that they will pass your information on to your Representative. It is easy!